Is remote work really all it’s cracked up to be? This guide will help you answer that question using survey results from over 1,900 remote workers. 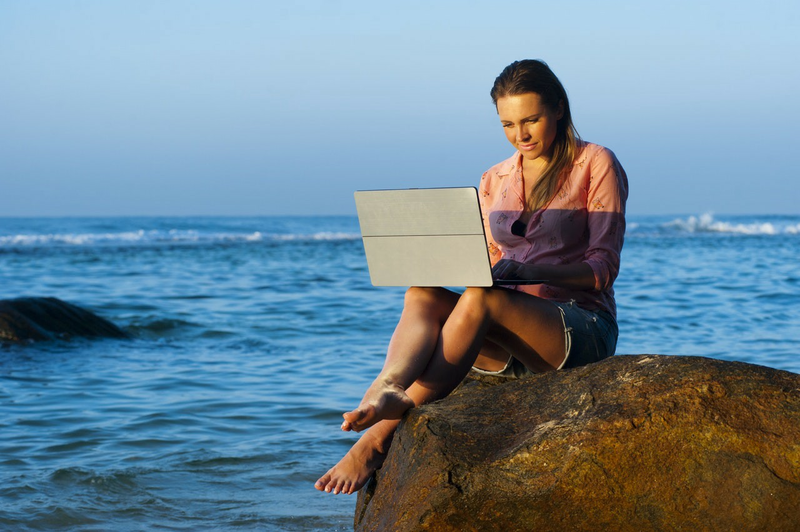 Have you ever considered working remotely? While many people dream of being able to work from home or anywhere else in the world, far less actually take the leap due to a number of different reasons and hesitations. But what if there was a way for you to hear from other freelancers and remote workers about what they really think about this fast-growing option before making the jump for yourself? Thanks to Buffer’s annual Remote Work report, which we’ll be diving into today, you’ll have a first-hand account of what current remote work is like from the people living it day in and day out. We’ll also share a few of our favorite tips for helping you minimize your risks while maximizing your income in the remote work world. So let’s jump right into the data. To gather this data, the team at Buffer interviewed over 1,900 remote workers from all across the globe. #1. Most people work from home (78%), while 9% and 7% show up to a real office or coworking space, respectively. So while remote workers have the flexibility to work from anywhere, many find setting up a home office base less distracting, which leads to greater productivity, and costs less. If working from home sounds appealing to you, and the thought of finding another office cubicle to fill gives you just the opposite feeling, remote work could be a great option. #2. Many freelancers (81%) also work while traveling. Having the flexibility to keep working on-the-go means you can extend your “vacations” and mix a bit of work in with your pleasure seeking so you’re still earning money. So despite wanting to travel as often as possible, you won’t have to go broke doing so. #3. Only 18% of remote workers earn between $50,001 and $75,000. This may sound like a sad reality, but it’s not always the case when you follow the right strategy. First, it’s important to understand that when it comes to remote work, your earnings reflect the amount of time you put in. So, while 28% of remote workers make $25,000 or less, they’re probably only working part-time, which can be a draw for many people like stay-at-home parents, students, and those looking for a side hustle. Instead of having to clock in long eight- or 12-hour days, remote work can be done in as little as four to six hours whenever it fits in your schedule. But this extra freedom comes at a cost: a lower salary. Start working full time and you may be one of the 18% earning $50k+ or part of the other 18% earning salaries in the $25,001 to $50,000 bracket. Unless you’re a remote employee for a company with a fixed annual salary, most remote workers have total control over the amount they earn. We’ll share a few tips for increasing your revenue later in this guide, but before we do, you should consider these pros and cons about working remotely as well. People admitted to being so satisfied with this style of work that 90% of respondents hope to work remotely until they retire. • And 3% admit it’s easier to exercise and improve your health without a traditional schedule or office job. 55% of remote workers only use 15 (or less) vacation days per year and 16% take less than five vacation days annually. While this may seem startling, the same can happen at a traditional office job. New HR policies like “unlimited vacation days” attract new hires but do just the opposite for them. Stats say these incentives cause employees to take less time off and even creates competition among employees for who takes the fewest days off when it comes time for promotions. One upside here is that 11% of remote workers take 30 or more vacation days, which goes to show it’s certainly possible to do as long as you choose to make it that way. What Do You Think About Remote Work Now? Knowing this first-hand information about remote work, has your opinion of it changed? While you may consider a few of these stats downsides, there are ways to get around them so you can focus on all the upsides of working remotely. For instance, instead of going completely solo on your own and starting your own business, you can transition by finding a position at a company hiring remote workers. With this, you’ll have the same backing and steady paychecks as a traditional job, but you won’t have to physically go into an office. Plus, you’ll also cast a wider net geographically and open up the number of positions you can apply for since it won’t matter where you live. You can even try to match or at least get close to your current salary to help reduce the financial risk of remote work. When it comes to combating the lonely aspect of remote work, frequent communication with co-workers, getting out of the house every once in a while, networking with other freelancers, and using coworking spaces can all help this situation. And finally, if you want to vacation more, you have to make it a priority. Remote work will give you the ability to take your work on-the-go or plan ahead so you don’t have to work while you’re away. This flexibility, combined with the growing need for top talent, are two major reasons why remote work is only going to continue to rise in the future. If you want a remote job offering these benefits and more, click this link to see current job openings now and join the growing network of employees working on their terms while still earning a great living. Now that you have a better idea of the state of remote work, you can decide for yourself if it’s something that may be right for you. And if you need help finding a remote job, check out the tips in this guide next.